Nice greetings this Easter season . 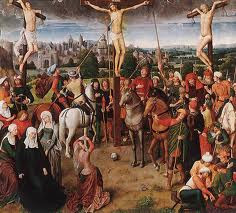 I bring you the message and full chapter on the crucifxion of Jesus' christ,It is the greatest sacrifice for mankind..
Joh 19:1 Then Pilate therefore took Jesus, and scourged him. Joh 19:3 And said, Hail, King of the Jews! and they smote him with their hands. Joh 19:4 Pilate therefore went forth again, and saith unto them, Behold, I bring him forth to you, that ye may know that I find no fault in him. Joh 19:5 Then came Jesus forth, wearing the crown of thorns, and the purple robe. And Pilate saith unto them, Behold the man! 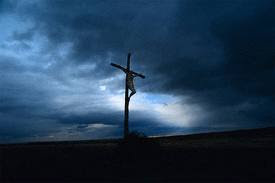 Joh 19:6 When the chief priests therefore and officers saw him, they cried out, saying, Crucify him, crucify him. Pilate saith unto them, Take ye him, and crucify him: for I find no fault in him. Joh 19:7 The Jews answered him, We have a law, and by our law he ought to die, because he made himself the Son of God. Joh 19:9 And went again into the judgment hall, and saith unto Jesus, Whence art thou? But Jesus gave him no answer. Joh 19:10 Then saith Pilate unto him, Speakest thou not unto me? knowest thou not that I have power to crucify thee, and have power to release thee? Joh 19:12 And from thenceforth Pilate sought to release him: but the Jews cried out, saying, If thou let this man go, thou art not Caesar's friend: whosoever maketh himself a king speaketh against Caesar. Joh 19:13 When Pilate therefore heard that saying, he brought Jesus forth, and sat down in the judgment seat in a place that is called the Pavement, but in the Hebrew, Gabbatha. Joh 19:15 But they cried out, Away with him, away with him, crucify him. Pilate saith unto them, Shall I crucify your King? The chief priests answered, We have no king but Caesar. Joh 19:17 And he bearing his cross went forth into a place called the place of a skull, which is called in the Hebrew Golgotha: Joh 19:18 Where they crucified him, and two other with him, on either side one, and Jesus in the midst. Joh 19:21 Then said the chief priests of the Jews to Pilate, Write not, The King of the Jews; but that he said, I am King of the Jews. Joh 19:23 Then the soldiers, when they had crucified Jesus, took his garments, and made four parts, to every soldier a part; and also his coat: now the coat was without seam, woven from the top throughout. Joh 19:25 Now there stood by the cross of Jesus his mother, and his mother's sister, Mary the wife of Cleophas, and Mary Magdalene. Joh 19:28 After this, Jesus knowing that all things were now accomplished, that the scripture might be fulfilled, saith, I thirst. Joh 19:29 Now there was set a vessel full of vinegar: and they filled a spunge with vinegar, and put it upon hyssop, and put it to his mouth. Joh 19:38 And after this Joseph of Arimathaea, being a disciple of Jesus, but secretly for fear of the Jews, besought Pilate that he might take away the body of Jesus: and Pilate gave him leave. He came therefore, and took the body of Jesus. Joh 19:39 And there came also Nicodemus, which at the first came to Jesus by night, and brought a mixture of myrrh and aloes, about an hundred pound weight. Joh 19:42 There laid they Jesus therefore because of the Jews' preparation day; for the sepulchre was nigh at hand. The Message: Jesus paid the price for our sins more than 2000 years ago...Accept Him today! In the spirit of Easter! GET THEFINANCIAL MASTERY PACK !